In this combined concert, two of the School of Music’s world music ensembles share the stage. 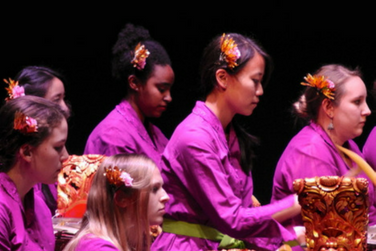 The Gamelan ensemble offers traditional Balinese music played on the gong kebyar style percussive instruments, showcasing complex interlocking rhythms, multifaceted expressions and the delicate motions of Balinese dance. The Japanese Koto Ensemble features music played on traditional Japanese 13-string instruments. Known as sōkyoku, koto music reflects the quiet beauty, simplicity and harmonizing effect of Japanese nature.